In this article we will know about Co-generation advantages and their application .we will also know about the basic meaning of Co-Generation.we will also discuss about the topping and bottoming cycle. Co-generation means sequential conversion of energy contained in fuel into two or more usable forms. In one manifestation the energy of coal is converted into heat in the boiler to produce steam. This steam is used to generate electrical energy and in addition provides heat for manufacturing process. In another manifestation gas is used in gas turbine to generate electrical energy. The remaining heat is used to produce steam in a heat recovery boiler. This steam is used for generating more electrical energy or is used as process steam for manufacturing process. 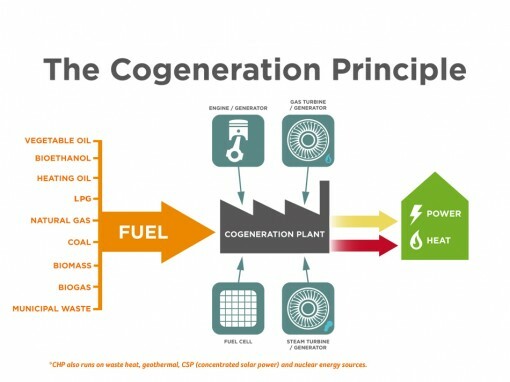 Thus a conventional system uses energy of fuel to produce electrical energy for thermal energy (for manufacturing process) whereas a co-generation system produces both from the same primary fuel. A conventional system needs more fuel to give the same total energy output than a co-generation system. A co-generation system can be either an in plant power generation system or a reject heat utilization system. The implant power generation is used industries and is illustrated in. The industry needs both process steam and electricity. In conventional method steam is produced by a boiler and is electricity is either purchased from a utility or generated by a diesel generating set. If co-generation is used, the boiler is made to produce steam at a higher temperature and pressure than needed for manufacture purposes. This steam is a turbine generator set to produce electricity. The exhaust steam (from turbine) is used for manufacturing purpose. The reject heat utilization system is used in power plants. Some steam is extracted from the turbine (at a suitable temperature and pressure) and supplied to a n adjacent industry for manufacturing purpose. This is illustrated. 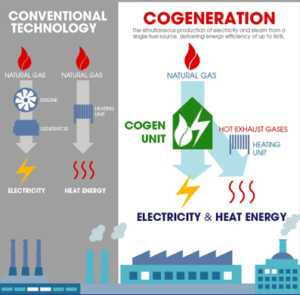 These are some Co-generation advantages which are given below . Many case studies have been conducted to estimate the costs per kW of installed capacity in power plants and the additional capital costs need to generate electricity by adopting co-generation systems. it is seen that an industry needing steam for processing has to invest in boilers. The extra investment needed to upgrade boiler so that electricity can also be generated is pretty small as compared to the cost of boiler. It has been estimated that incremental investment in co-generation system is only about 50% of the investment needed by an electric utility to supply the same power to industry. Thus co-generation result in enormous savings in capital costs. A utility needs about 6 year to add a thermal generation system. However the installation of a co-generation system by an industry needs only about 3 years. The lower gestation period result in saving in interest, early utilization of facility, early return on investment and lesser chances of cost escalation of project. 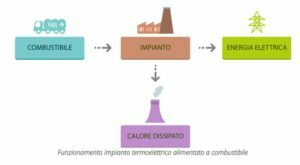 Many case studies have been conductor to estimate the capital costs per kW of installed capacity in power plants and the additional capital costs needed to generate electricity by adopting co-generation systems it is seen that an industry needing steam for processing has to invest in boilers. The extra investment needed to upgrade boiler so that electricity can also be generation is pretty small as compared to the cost of boiler. It has been estimated that incremental investment in co-generation systems is only about 50% of the investment needed by an electric utility to supply the same power to industry. Thus co-generation result in enormous saving in capital costs. it most important co-generation advantage. A utility needs about 6 year to add a thermal generation system. However the installation of a co-generation system by an industry needs only about 3 years. The lower gestation period results in saving in interest, early utilization of facility, early return on investment and lesser changes of cost escalation of project. If an industry opts for co-generation to meet its electricity demand, it will not face any power cuts. Moreover, a well designed co-generation scheme can be very reliable. Thus the industry will benefit in this respect also. The commercial co-generation technologies being presently used for topping cycles are steam turbine, gas turbine, combined cycle and diesel engine systems. In addition fluidized bed combustion (FBC), magneto-hydro-dynamic (MHD), fuel cells and some other conversion are being developed.these are also a type of Co-generation advantages. The steam turbine system uses the equipment similar to that in a thermal plant i.e. boiler, steam turbine, generator and other auxiliaries. The fuel used may be oil, natural gas, coal, wood or other similar materials. The high pressure steam produced by the boiler drives a steam turbine which is coupled to generator. The low pressure exhaust from the steam turbine is used for industrial process applications, space heating etc. Back pressure steam turbines are generally preferred because they exhaust low pressure steam and are more efficient. The boiler used by industries for producing process steam is generally low temperature low pressure boilers. If such an industry opts for co generation, replacement of these boilers by those producing, high temperature, high pressure steam is invariable necessary. If an industry installs steam turbine equipment for co-generation, the pollution level is likely to increase. Sulfur oxides. Nitrogen oxides. Particulates and fly would pose problems and special pollution control measures would be necessary. Case studies revealed an energy saving of about 13% if steam turbine co-generation system is installed. The steam-turbine system has the added advantage of fuel flexibility. A gas turbine system consists of compressor, combustion chamber, gas turbine and generator. Air is compressed by the compressor and supplied to combustion chamber. Fuel (oil or natural gas) is burnt in the combustion chamber and heats the compressed air. This hot pressurized gas expands in a turbine which drives the generator. The exhaust from the combustion chamber is used as process heat. If necessary the hot exhaust gases can be used to raise steam in a waste heat recovery boiler where the heat of the gases is transferred to water. Due to scarcity and high cost of petroleum products, the cost of electricity generated by this cycle is rather high. Gas turbines need more maintains than steam turbines. Case studies have revealed an energy saving of about 25% if this cycle is used for co-generation system. it is most used co-generation advantages. This system is a combination of gas turbine and steam turbine systems. The gas turbine exhaust is used in waste heat boiler to raise steam. If necessary additional fuel is added to waste heat boiler. The steam, from the boiler, is used in a back pressure turbine which drives another alternator to produce electricity. The low pressure exhaust from steam turbine is used as process steam. This system has greater flexibility for topping steam. Case studies have indicated an energy saving of about 35% by a combined cycle co-generation system. hence these are co-generation technologies advantages. For knowing more about the Co-generation advantages you must watch this video. The implant power generation (co-generation) system can be topping cycles or bottoming cycle. In a topping cycle, fuel is burnt in the boiler to produce high temperature steam. This steam is expanded in a turbine coupled to a generator to give electric power. The reject heat from the turbine is used for manufacturing process. The reject heat from process is used to generate electrical power. Thus in a topping cycle electrical energy is produced first whereas in bottoming cycle heat energy is used first. Generally the steam require for industrial process is at low temperature whereas high temperature steam is needed for electric power generation. Therefore only the topping cycle is used. The bottoming cycle has very limited utility. The overall efficiency of a topping cycle is around 75% as compared to a combined efficiency of about 55% for two separate systems (for producing electrical energy and steam). Hence these are Co-generation advantages if you will find any incorrect in above article you must comment below in comment box.